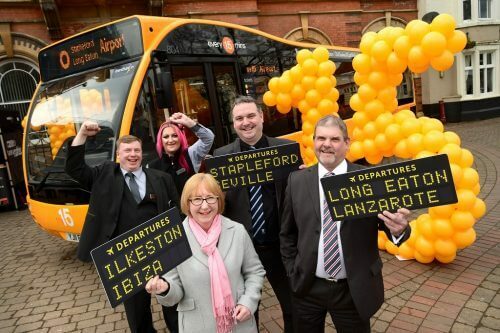 Trent Barton has launched a new my15 bus link, connecting Ilkeston, Stapleford and Sandiacre residents to East Midlands Airport. An extension to the existing my15 service, the new link offers direct access to the thousands of new jobs being created in and around the airport. East Midlands Airport and the businesses in the East Midlands Enterprise Gateway (EMEG) area currently employ 10,000 people, with 20,000 potential new jobs to be created in the next two decades. Beginning on March 25, the service runs every hour, seven days a week; the existing my15 route is seeing an increase in frequency, too, now running every 15 minutes. Completing the list of the firm’s announcements is the introduction of eight newly-refurbished buses to bolster the fleet – as well as the creation of eight new jobs. The renovated my15 vehicles include USB charging points. Jeff Counsell, Managing Director at Trent Barton, said: “my15 has, in one form or another, been a staple of the Erewash community for more than 50 years. By creating this direct link, we aim to help local people to be part of the jobs bonanza at and around East Midlands Airport in the coming decade. “Working in partnership with East Midlands Airport over the last 10 years, we’ve created a quality, high-frequency network to connect workers and jet setters to this growing region. Erewash MP, Maggie Throup, added: “It’s really good that the people of Ilkeston and other communities along the route are going to get such a frequent service to access the increasing number of work opportunities at and around the airport. Geoff Moss, East Midlands Airport’s Asset Director, commented: “We’re delighted that Trent Barton is increasing both its fleet of buses and the frequency of the service to the airport. We have ambitious plans for the airport which will increase the number of jobs across the site.